"From the dusty mesa, her looming shadow grows. Hidden in the branches of the poison creosote." We are all but a fading memory trapped in locked rooms. Acolytes of nothingness deluded into existence as metaphysical nightmares, desperately clinging onto illusory sentience. Caught in the rivers of the psychosphere, we row through cyclical waters, doomed to repeat and forget. Ash and aluminum hang still in the thorny air leading to the crimson shores of Carcosa; where the dead wear horns, and the flat face of time bears down, mocking us. Cruelly and heartlessly we -- whoa, sorry about that. I got a little intense there. But after listening to about eight hours of Rust Cohle talking, can you blame me? Part of the duo of protagonists that headline HBO's 'True Detective,' Rust is one of contemporary television's most singular creations -- and he's just a small piece of what makes the series so powerful. A startling maze of esoteric gloom and escalating tension, the show offers an unconventional twist on the tried-and-true police procedural format, creating a wholly unique detective drama that shines a dwindling light on the eternal struggle between good and evil. 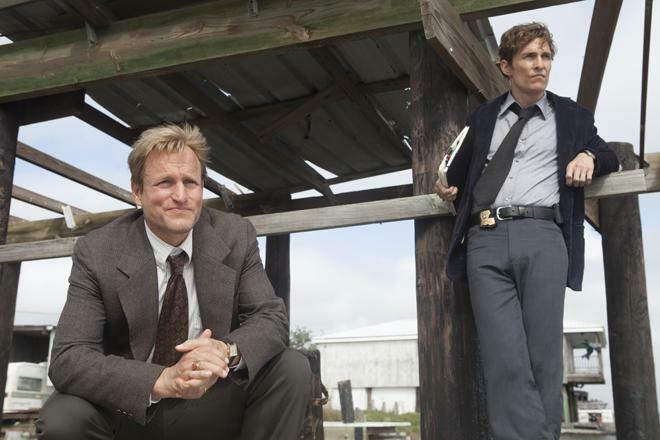 Set throughout three distinct time periods, the show focuses on two detectives -- Rust Cohle (Matthew McConaughey) and Marty Hart (Woody Harrelson) -- as they recount the events of a disturbing murder case that they reportedly solved several years ago. Little by little we bear witness to the evolving mystery, and it soon becomes clear that this case might not be closed after all. With their personal lives and friendship torn asunder by the horrors of their job, the two men will have to put aside their differences if they want to finally catch the killer once and for all. We start the series in 2012 with both detectives being interviewed separately for unknown reasons. As each tells their own version of past events, we periodically flash back to 1995 where the majority of the series' first half takes place. The narrative also segues into 2002 as well, and throughout all three time periods we begin to piece together a large, twisting puzzle full of murder, conspiracies, and unrelenting dread. And more than just an engrossing expose on the duo's homicide case, the story also places an equal emphasis on the characters' personal lives, revealing the gradual dissolution of their partnership and friendship as the dark realities of their profession continue to take their toll. At its core, the winding murder case is more or less structured like any standard procedural, with obligatory sequences dedicated to the detectives canvassing crime scenes, following leads, and interviewing suspects -- but what makes 'True Detective' so special is its esoteric writing and visual style. Clearly differentiating itself from the run-of-the-mill point and shoot cop shows that riddle network TV, the series is home to a palpable sense of gloom and foreboding in every shot and every syllable. A general atmosphere of escalating dread and dreamy horror is established from the get go, using sight, sound, character, and plot to create a truly cinematic experience that rivals anything the big screen has to offer. Helping to engender this unusually strong artistic voice, is the show's unconventional use of a single writer and director for all eight episodes. While most TV series feature multiple scribes and directors throughout a season, here showrunner Nic Pizzolatto scripts every episode and filmmaker Cary Fukunaga helms each installment. Together, this consistent pairing gives the show a singular style, making the entire season feel like a cohesive whole, with each episode building upon the next. To this point, the season is also completely self-contained, with a beginning, middle, and a definitive ending that closes the book on this story (future seasons will focus on new cases and characters). For his part, Fukunaga channels elements of David Fincher, David Lynch, and Michael Mann, creating a distinct ambiance all his own that relies on a slow and gritty visual temperament marked by impeccable framing and a hazy rhythm. Frequent establishing shots and cutaways focused on ominous aerial tracking shots of Louisiana swamps and industrial landscapes also help to elaborate on the show's menacing tone. And while much of the series adheres to a more controlled tempo, key sequences unleash a comparatively chaotic and sustained sense of tension -- including the impressive extended single shot sequence that ends episode four. Giving purpose and context to the show's haunting imagery, are Pizzolatto's deep and complicated scripts. More than just an expertly plotted murder mystery, the series becomes a philosophical rumination on the very nature of good and evil, using metaphysical themes and concepts to probe deep into the psychosphere of men and monsters. Pizzolatto layers the story and dialogue with cryptic musings and heady observations, examining ideas tied to heroism, time, existence, friendship, depravity, sacrifice, and the incessant, nagging call of unfinished business. As the pitch-black heart of darkness is gradually revealed, the writer weaves in a vague mythology for his monstrous killer, steeped in devil worship, unspeakable rituals, and mounting conspiracies. But as mercilessly disturbing as the subject matter can get, the show always maintains a light in the dark. Serving as the series brooding hero, Rust Cohle becomes Pizzolatto's chief mouthpiece for all of the show's dark philosophical musings. A nihilistic messiah of pessimistic justice, Rust is a tortured soul driven to face the horrors that most men blind themselves to. Full of an endless supply of cynical observations and abstract contemplations, he is, as the character so astutely states himself, "bad at parties." Though Matthew McConaughey has had a string of impressive performances in recent years, including his Oscar winning turn in 'Dallas Buyers Club,' his interpretation of Rust Cohle is easily his very best dramatic work to date. The actor fully loses himself in the role, revealing a fiercely honed intensity and a deep, hidden sadness. One can see the very weight of the world in his tired eyes, and every stinging monologue he spouts on the emptiness of existence crackles with doomed insight. Of course, an entire series dedicated to Rust's gloomy bedside manner would get very old very quickly, and thankfully we have Marty Hart to even things out. Acting as the show's everyman hero, Hart is an average guy but a good detective in his own right. Not exactly prone to heady intellectual conversation, the character serves as a perfect counterpoint to Rust, and Woody Harrelson turns in a fantastic performance. The actor deflates McConaughey's steadfast gravity perfectly, grounding the series with some much needed humor. His frustrated reactions to all of Rust's metaphors and vague allusions are the source of many laughs, and the two actors (who are good friends in real life) play off each other brilliantly. Though the part is decidedly less flashy than McConaughey's, Harrelson does a great job of layering the character, playing up his many weaknesses without losing sight of a central code of honor. Indeed, while both men prove to be deeply flawed, when the stakes are raised, they are each capable of great acts of heroism, proving that evil can't win without a fight. Or as Marty might more eloquently put it… it's just f#&%ing great. HBO brings 'True Detective: The Complete First Season' to Blu-ray on three BD-50 discs that come housed in a foldout case within a sturdy cardboard outercase. Instructions for a digital copy are also included. After a skippable HBO promo, the screen transitions to a standard menu. The show is provided with a 1080p/AVC MPEG-4 transfer in the 1.78:1 aspect ratio. Shot on 35mm, the impressive image has a natural, filmic appearance that complements the show's cinematic style perfectly. The source print is in pristine shape with a light to moderate layer of grain visible throughout (darker scenes tend to be heavier). With that said, I did detect some very minor signs of compression artifacts like false contouring (particularly in skies) during isolated transitions and fades. Though never razor sharp, clarity is strong throughout, offering a pleasing sense of fine detail, texture, and dimension, highlighting every brooding furrow on Rust and Marty's brows. The Louisiana setting is integral to the series, and various aerial shots of swamp lands and industrial cityscapes are especially striking. The color palette is cast in a frequent yellow haze, and outdoor scenes emphasize the hot tones of the Louisiana locations. Contrast is nicely balanced with bright whites and deep, inky blacks. 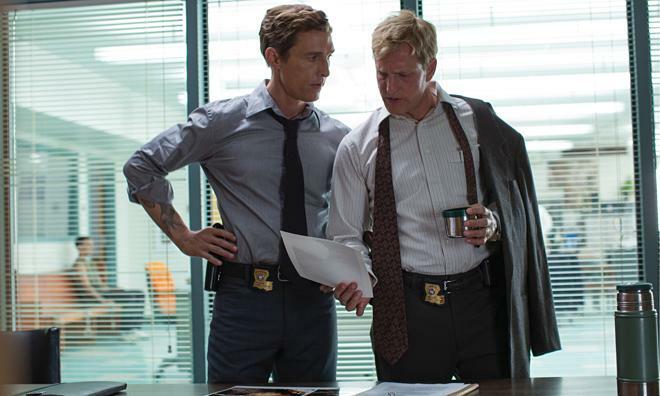 With the exception of some fleeting artifacts, 'True Detective' comes to Blu-ray with an impeccable transfer that preserves the show's powerful visual style. The series is presented with an English DTS-HD MA 5.1 track along with a French DTS 5.1 and Spanish DTS 2.0 track. Optional English SDH, English, French, Spanish, Norwegian, Finnish, Dutch, Danish and Swedish subtitles are also included. Led by T Bone Burnett's incredible score and song selections, this is a spacious and atmospheric mix that expertly bolsters the show's gloomy tone. Speech is full and clear throughout with no balance or technical issues to speak of, giving ample clarity to all of Rust's trademark philosophical ramblings. The track has a strong sense of ambiance and auditory texture, spreading nature effects like crickets, birds, frogs, flies, and rustling trees seamlessly throughout the soundstage, bringing the Louisiana setting to life. Indoor locations like the police station are given similarly effective moods, and specific locations like rowdy bars and clubs offer some more aggressive low frequencies. Action heavy scenes, like the much talked about climax of episode four, are also extremely immersive, sucking the audience into the show's world with lively design work and natural imaging. Voices are also spread directionally when called for, and T Bone Burnett's striking score and fitting song selections come through with crisp fidelity and clean separation, extending the series' foreboding tone with escalating rhythms and eerie bass cues. Likewise, aggressive effects like gunshots, explosions, and revving motorcycle engines all carry a powerful kick. Moody and delicately atmospheric, the audio mix provides a stylistically immersive experience, elaborating on the series' dark themes and escalating tension. HBO has included a strong assortment of supplements, including two commentaries and several featurettes with the cast and crew. All of the special features are presented in 1080p with DTS 5.1 sound (unless noted otherwise). Inside the Episode (HD, 12 min) – Individual featurettes focused on episodes 1, 2, and 3 are viewable separately or together. The extras feature interviews with the show's writer, Nic Pizzolatto, and director, Cary Fukunaga, discussing the plot, setting, themes, visuals, characters, and relationships of each episode. 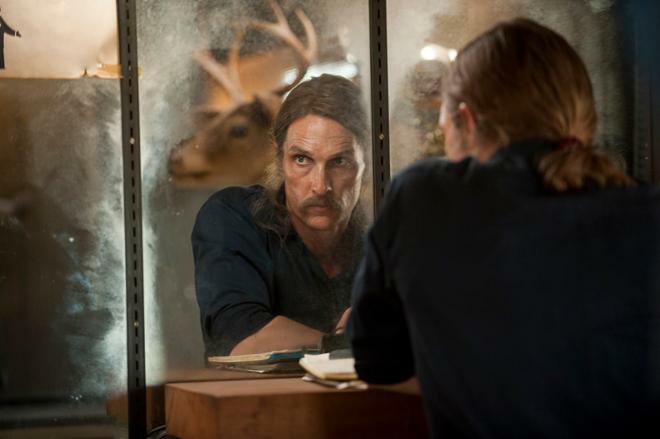 Right off the bat, Pizzolatto reveals a certain level of intensity that makes it easy to see where many of Rust Cohle's personality traits come from. Deleted Scene (HD, 6 min) – A single deleted scene is include from episode 3. The sequence is an extended sermon with Shea Whigham's character. Though it features great acting, the full scene would have dragged down the episode too much. Audio Commentaries – Commentaries by writer Nic Pizzolatto and composer T. Bone Burnett are provided on episodes 4 and 5. In addition, the episode 5 commentary also features executive producer Scott Stephens. The participants offer some solid production trivia and insights into the show's themes, characters, writing, editing, cinematography, casting, cut material, and music. Likewise, Pizzolatto also addresses some criticisms and internet comments he's come across. Though definitely worthwhile, the group isn't always very chatty, and there are some notable lulls and gaps in their conversation. Inside the Episode (HD, 14 min) – Featurettes dedicated to episodes 4, 5, and 6 are viewable separately or together. Once again, the show's writer and director address the plot and character developments of each installment. In addition, they also offer some interesting behind-the-scenes insights into how they pulled off the impressive extended shot climax of episode 4. Making True Detective (HD, 15 min) – Presented in 1080i, this is a behind-the-scenes documentary about the show's production that offers on-set footage and interviews with the cast and crew. The participants elaborate on the show's story, cast, scripting, Louisiana setting, weather/wildlife difficulties, visuals, and sets. Once again, we also get more details about the infamous episode 4 long take, including a look at the rehearsal process. Inside the Episode (HD, 10 min) – Featurettes focused on episodes 7 and 8 are viewable separately or together, offering insights from the writer and director on the show's conclusion. Deleted Scene (HD, 4 min) – One excised scene from episode eight is included. The sequence is simply an extended reel of aerial footage focused on Louisiana swampland and industry set to T Bone Burnett's score, but it's a very moody and effective piece in its own right. Up Close with Matthew McConaughey and Woody Harrelson (HD, 8 min) – Presented in four parts viewable separately or together, in this featurette the actors discuss specific scenes and their overall feelings about the project. They also share a fun anecdote about shooting their brutal fight sequence. A Conversation with Nic Pizzolatto and T Bone Burnett (HD, 14 min) – The show's creator/writer sits down with the series' music director in this one on one conversation. The duo talk about their approach to the show's music and song selection, and also address more criticisms while elaborating on Rust and Marty's specific brand of heroism and honor. Though the tone can seem a bit too self-congratulatory at times, there are several worthwhile insights here. 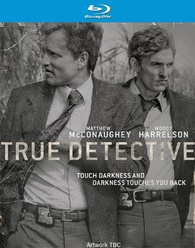 'True Detective: The Complete First Season' offers a dark and complicated murder mystery marked by metaphysical themes of good and evil, striking visuals, and memorable characters. The video and audio presentations are both impressive, perfectly enhancing the show's gloomy atmosphere. Supplements are plentiful and informative, providing lots of worthwhile insights into the production. A truly original and powerful spin on standard police procedurals, this is a masterful piece of small screen storytelling and an exceptional release from HBO. Highly recommended.